Is the war the greatest to sweep dry land, as opposed to the whole world including the oceans, or is it the greatest to sweep the Earth? I suspect the latter, so remember to always capitalize the name of a planet, even yours. Change the comma after Earth to a period. Change the period after fire to a comma and continue the compound sentence with yet. To get to is slightly awkward and may sound better as to reach. 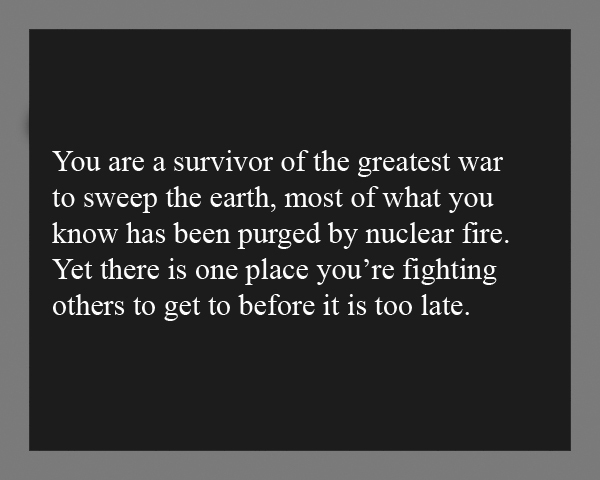 You are the survivor the of the greatest war to sweep the Earth. Most of what you know has been purged by nuclear fire, yet there is one place you’re fighting others to reach before it is too late.